Education: How Do We Get Our Children To Read And Count? On 26th September 2017, The World Bank released a report titled ‘Learning to realize Education’s Promise 2018’ in Washington District of Columbia. According to the report, at least 20 per cent of pupils in Primary Two in Uganda can perform a two-digit subtraction, whereas 39 per cent can read a single word of a short sentence. Precisely, 80 percent and 61 percent of our Children are moving in the dark – when it comes to dealing with basic math and reading! This is tangential to the memorable motto “Taaha Omukuhweeza” that is translated in English to ‘enter the embrace of the Light’ coined by Canon.Petero Rwabihurwa, a pioneer educationist and evangelist in Kigezi in the early 1950s. Indeed, in rural Uganda, lights deem really deep and nearly three-quarters of students in Primary three could not solve a two-digit subtraction such as “46 – 17” and by Primary five, half still could not do so according to the report. As a parent, citizen and neighbor; this goes to the core of our survival and future competitiveness in a highly paced world. Taking consideration of its obligations to citizenry - the easy, lazy and convenient path is to just do nothing and blame government. Yet, the complexity of education requires all, and all of us to do something to change this situation. Among others, the World Bank report points to lack of effective teaching as the principal element why learning is not taking place in Uganda’s broader education system. The questions for stakeholders – especially so; government, parents, faith organizations, media and private sector – is – How do we get our kids to read and count? How do we reconfigure our education and lessons delivery to achieve effectiveness? How do we innovate to improve classroom management, stem teacher and pupil absenteeism, inspire accountability and create a generation of curious, agile and high impact citizenry? How do we move from mere schooling to learning in our education system? One pathway to answer some of the foregoing questions is to have our pupils get supplementary literacy and numeracy lessons. This is because, reading and counting are the two critical prerequisites and base skills that learners require to navigate other subjects. A weak base in masterly of numeracy and language proficiency have long term deleterious consequences for learners, workforce and development ambitions of Uganda. In fact, a challenge for teachers in Uganda – and across the world, and in every kind of school - is that there is always a gap between where their students are performing and where the national curriculum demands that they should be. A classroom of students might, overall, be far behind what the national curriculum demands. This means that such students need a bigger challenge. At Bridge schools Uganda, deriving from the national curriculum, the Ugandan instructional design team has created lessons that allow teachers to better meet the needs of their students based on how they are performing. The accelerated English and Math mentoring helps Bridge pupils achieve learning gains in literacy and numeracy. The basis of the effort is to ensure that the slow learners are supported to catch up with their grade levels, while the faster learners are challenged. Precisely, Bridge offers extra 1-2 lessons per day of English instructions and 1 extra lesson per day of Mathematics instruction. During their morning Math lesson, they practice problems like 138 + 44. However, when the teacher checks their work, pupils are not answering correctly because they do not know how to regroup or carry numbers over to the next place value. During the afternoon extra English lesson, pupils have the opportunity to practice learning both sight words like “the, and, for, here” and also learn phonics so that they can sound out new words on their own. This instruction is deliberately designed to bridge the gap between how students are performing in English and where the Uganda national curriculum expects them to be. During the Afternoon extra math, pupils have the opportunity to practice the simplest form of regrouping- with 2 digit and 1 digit numbers. The teacher models the difference between 17 + 2 and 17 + 4. Students then get lots of practice at that level of rigor so that they can master the concept of regrouping as quickly as possible. This approach is already delivering amazing results. Bridge has used Early Grade Reading Assessment (EGRA) and Early Grade Math Assessment (EGMA) to complement its work by providing item-level data on pupils’ fundamental literacy and numeracy skills. From a Rapid Cycle Measurement of P3 Literacy for Program Improvement, Bridge was able to recognize that Bridge pupils outgained their peers by 5.7 words per minute on Familiar Word Reading and 14.6 words per minute on Passage Fluency across the same period. They also understood even more of what they read, answering an extra 9 percentage points more comprehension questions correctly. The latest vindication of the foregoing are the results of the 2017 Kenyan Certificate for Primary Education (KCPE). KCPE is the national primary exit exam and the results determine whether children have the opportunity to continue with their education. 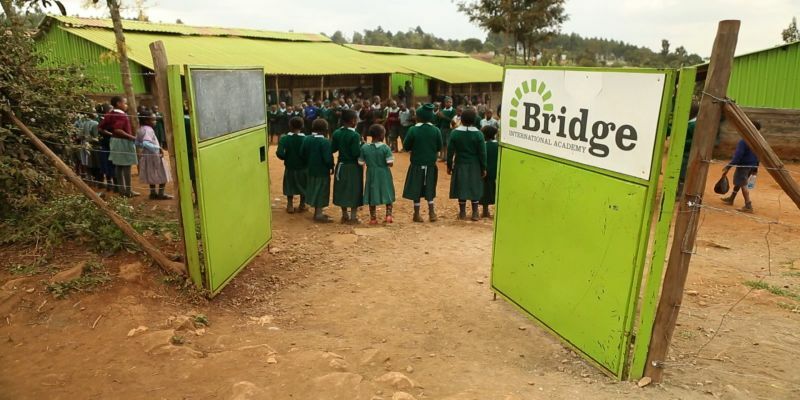 In the exam, Bridge pupils exceeded their peers nationwide by over 10 percentage points with thousands scoring at or above the 250 marks designated as a pass by the Kenyan Government. This outperformance is even more impressive since the nationwide average includes pupils attending elite private schools as well as those in government schools. An impressive 86% of Bridge pupils scored over the 200 marks making them potentially eligible for a secondary school. This compares to just 76% nationwide. Bridge pupils taking the exam came from across 44 of the 47 counties in Kenya where access to education is often challenging. The foregoing results are in sync with learning gains in Bridge Academies in Liberia captured in recent scientific publications. A stakeholder conversation on accelerated learning approaches for math and English should therefore urgently begin. There is goodwill from Government and the Minister of Education, Hon.Janet Kataha Museveni, who has consistently emphasized need for schools to focus on learning outcomes. Bridge is keen to continue working with government, parents, faith founded schools, media and broader stakeholders to deepen its demonstrable, working and results driven tendency. Country Director, Bridge Schools Uganda.